Mosquito Drill. 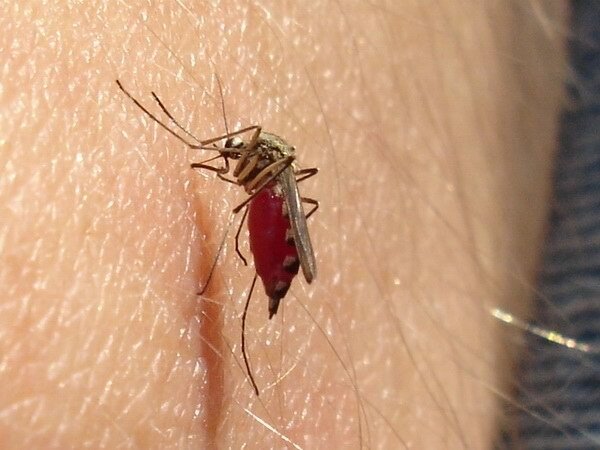 In September 2005 I attended a KaraNet party in Klagenfurt, not only along with many other users and dear friends, but also lots of mosquitoes. At one time Thomas decided to simply let the little blood-suckers do their feasting upon his hand, and I took some macro pictures. A bit later some of us were sitting in the shade of a tree in a circle and philosophised to our heart’s content. When another thirsty mosquito tried to approach me, I slapped it but did not kill it. The creature fell to the ground, obviously hurt and suffering in whichever way a small insect is capable of suffering. My dilemma was enormous: should I kill that innocent living being to alleviate its pain? Or would it survive on its own? Is a mosquito of “lesser worth” than animals we hold dear, like cats or dogs? Are they not equal? Fight or Flight. Recently, amidst a very interesting conversation with Thomas, a mosquito sat down right between his eyebrows. He noticed but did not react, and the creature sucked until it was sated enough to drop to the floor. I was quite impressed with his composure. – A bit later I felt a soft stinging on my left shoulder, turned my head and simply registered another mosquito. Integrity. Upon realising the futility of my efforts to “save the world” by trying to find solutions for my environment, I eventually decided in February to aim for self-development in the first place (“you should be the change that you want to see in the world” – Mahamta Gandhi). Thus I started to pursue particularly the concept of “integrity” (basically a congruency between thoughts, words and actions), and later discovered its relation to the Ambalatthika-Rahulovada Sutta. Since that time I experienced a strong boost of confidence and managed to resolve many internal and external conflicts with relative ease. When this whole process is more stable, I might describe it here in detail. Six Feet Under. My favourite series from HBO has already brought forth many eye-openers in the past. Another one struck me twice in the last two days (episodes 05×08 and 05×09). It seems like a mirror with a fist attached to it: the fist smashing right into my face to knock me awake, the mirror to reflect upon me things that I have to deal with in my own life. No happy endings, but a lot of food for thought and tears (as long as there are still so many things left to realise for me!). As for positive effects, I did not even think twice about radically changing my daily routine. No force applied, it came almost naturally, and many blind spots are dropping away. But let’s see how it goes in the future – two days do not have the same impact as weeks, months or years!